It happens to the best of us. We get excited about a new exercise program, or the idea of weight loss, or body recomposition, and we jump in feet first. We commit to ourselves that this time it will be different. We sign up at the gym and spend hours at the computer planning our training for the next 12 weeks. We calculate exactly how much weight we will lose each week from now until our goal date. We do all the research, buy all the books, read all the blogs, follow all the Instagram fitness accounts to learn everything we need to know to succeed. We hit the gym and feel proud that we’re actually doing it this time. We post our gym check-ins on Facebook and sweaty selfies on Instagram. A couple of weeks pass and the excitement starts to wear off, and life gets busy. The scale is not budging. We have a deadline at work, our kids get sick, our husband needs us. At first we feel bad missing a session or three, then after a while we forget all about it. We let ourselves off the hook for now, life is too busy. We’ll start over next month when…(insert your favorite excuse here). Then we step on the scale 30 days later and realize we need to do something about this, and think, “What is wrong with me? Why can’t I stick to this?” so we start the cycle again. As a trainer, I see this over and over again. People want to exercise, they know it’s good for their health, they have good intentions, but the reality sets in that exercise is hard, change is slow, and it’s easier to settle into a favorite TV show than another sweat session. 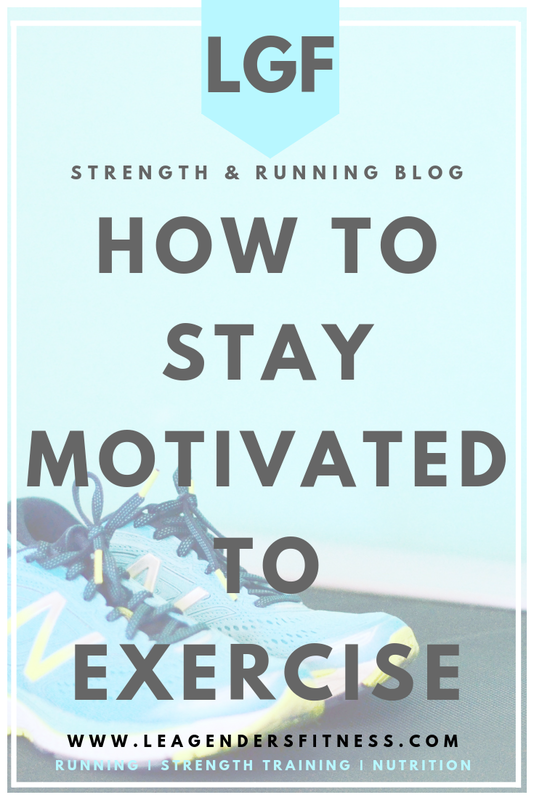 How to stay motivated to exercise. save to your favorite Pinterest board for later. 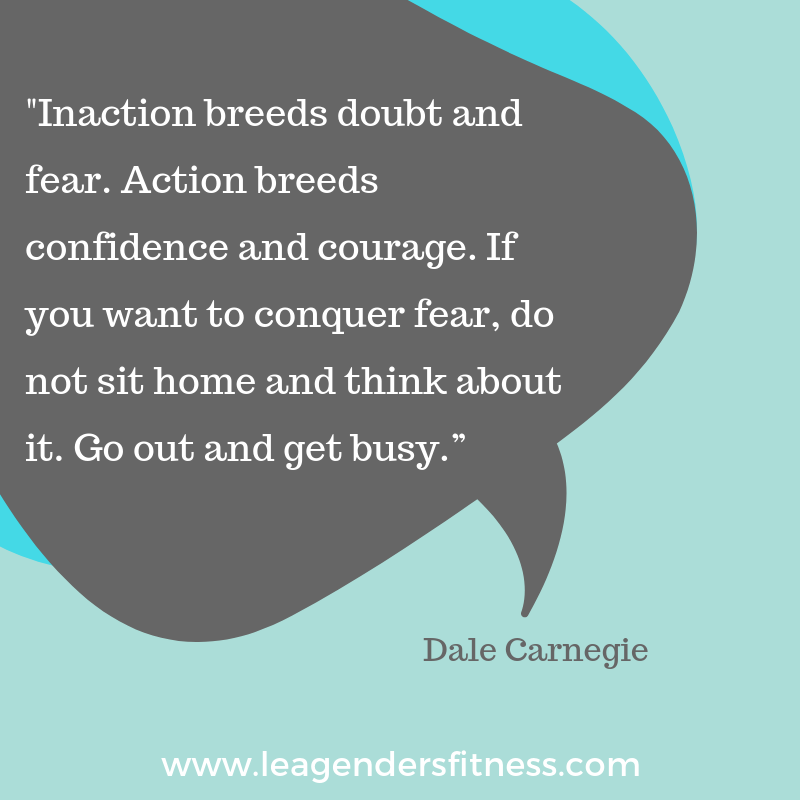 I love bare-minimum goals, because often the hardest part of exercise is getting started. Once we get going, we usually will want to finish the full session. A bare minimum goal might be to run or walk one mile a day. It might be to spend 15 minutes doing body weight exercises in the living room, or practicing Yoga for 10 minutes a day. You, of course, can always do more than the bare minimum, but the bare-minimum is the very least you need to do when life gets busy and crazy. We can always carve out 10-15 minutes, and 10-15 minutes of exercise is better than zero minutes of exercise. Bare minimum goals helps you establish a habit of exercise and habits matter more than motivation. You may lose motivation, and willpower is fleeting. If you spend the time cultivating healthy exercise habits, then working out will become part of your daily routine. Start small. What’s the bare minimum you can commit to today (not Monday, not the first of the month)? Some people love CrossFit (They’re crazy, right? Haha kidding CrossFit friends!). Some people love running ultra marathons. Good for them. If that’s not you, don’t try to force it. We’ll never be consistent doing something we hate. Hate running? Then don’t run. Find a way to move your body that you enjoy, and do that. It may take some experimenting. Sign up for some classes at the gym. Try Yoga, Try Spin, Try hiking with your dog, swimming or hip hop dance cardio. Hire a trainer, join a running club, or a bike gang (not that kind of gang). There are a million ways to move your body. Find the way to move that aligns with your preferences and your personality. It’s out there, I promise. The truth is we often feel more accountable to other people than we do ourselves. Find a workout buddy, hire a coach, join a social running group. When you have other people that are counting on you to show up, you just might do it. Hire me. Sometimes we lose motivation because the results don’t seem to match up with our efforts. If we don’t see significant results in a few weeks, we can get frustrated and discouraged. Real change and permanent results takes time. Instead of giving yourself 12 weeks to reach your goal weight, give yourself a year. A year seems far away, but if you don’t make any changes, you won’t be any better off in a year (and maybe worse). Time flies my friends, take advantage of every passing day. An effective strategy is to set process goals rather than outcome goals. We can’t control the outcome. If you want to lose a certain number of pounds in a certain number of weeks, your body might not agree with that timeline. Focus on the things you can control; the process. Set a daily or weekly goal of how much water you’ll drink, how many steps you will take, how many times you will work out. What you will eat. You can usually control what you do, you can’t control the timeline of the results. A big misconception is that exercise has to be a structured one hour session inside a gym. Not sure where to start? Move your body as much as you can throughout the day. Park your car in the farthest spot away from the front door. Take the stairs whenever possible. If you’re wearing appropriate shoes, sprint up those stairs. Take a walk after dinner. Return the grocery cart to the stall (ok, be a good human and do that anyway). Pace while you’re on the phone or scrolling Instagram. Take a walking lunch break. Walk your dog twice a day. If you don’t have a dog, offer to walk the neighbor’s or volunteer at a shelter. Move. Move. Move in whatever way makes sense to you. Once you start moving you’ll feel more energized and more likely to move more. Don’t rely on motivation to exercise. Work to build a habit of it, do something that you enjoy, recruit some buddies and celebrate along the way.